The benign opening scenes of Helix take place virtually every day at the Centers for Disease Control, along with global health centers all over the world. Dr. Alan Farragut, leader of a CDC outbreak team, is assembling and training a group of researchers to investigate a possible viral outbreak at a remote research called Arctic Biosystems. Tucked away in Antarctica under extreme working conditions, and completely removed from international oversight, the self-contained building employs 106 scientists from 35 countries. One of these scientists, Dr. Peter Farragut, is not only Alan’s brother but also appears to be Patient Zero. It doesn’t take the newly assembled team long to discover that all is not as it seems at Arctic Biosystems. Deceipt and evasiveness from the staff lead to the discovery of a frightening web of animal research, uncovering the tip of an iceberg of ‘pseudoscience’ experimentation that may have led to the viral outbreak, among other dangers. The mysterious Dr. Hiroshi Hatake, the head of Ilaria Corporation, which runs the facility, may have nefarious motivations, yet is desperately reliant on the CDC researchers to contain the situation. The involvement of the US Army engineers and scientists, culminating in a shocking, devastating ending to the third episode, hints that the CDC doesn’t think the outbreak was accidental. Most frightening of all is the discovery of two separate strains of the virus, Narvic A and Narvic B, the former of which turns victims into a bag of Ebola-like hemorrhagic black sludge, while the latter rewires the brain to create superhuman strength – a perfect contagion machine. 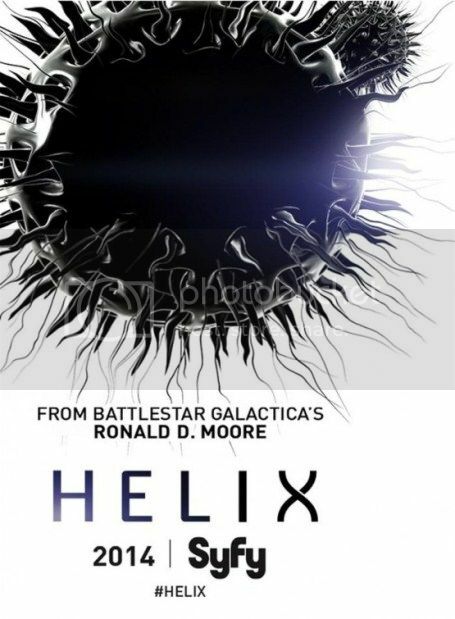 With some pretty brilliant sci-fi minds orchestrating the series, including Moore, Lost alum Steven Maeda and Contact producer Lynda Obst, it’s not surprising that Helix extrapolates extremely accurate and salient themes facing today’s scientific environment. 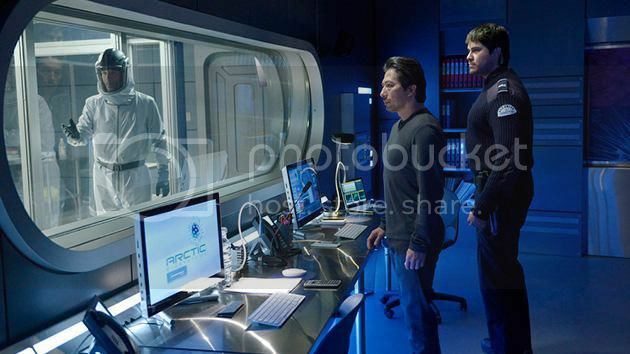 Spot on is the friction between communication and collaboration between the agencies depicted on the show – the CDC, bioengineers from the US Army and the fictional Arctic Biosystems research facility. In reality, identifying and curtailing emerging infectious disease outbreaks requires a network of collaboration among, chiefly, the World Health Organization, the CDC, the US Army Medical Research Institute of Infectious Diseases (USAMRIID, famously portrayed in the film Outbreak) and local medical, research and epidemiological outposts at the outbreak site(s). In addition to managing egos, agencies must quickly share proprietary data and balance global oversight (WHO) with local and federal juristictions, which can be a challenge even under ordinary conditions. To that extent, including a revised set of international health regulations in 2005 and the establishment of an official highly transimissible form of the virus created a hailstorm of controversy. In addition to a publishing moratorium of 60 days and censorship of key data, debate raged on the necessity of publishing the findings at all from a national security standpoint and the benefit to risk value of such “dual-use” research. Similar fears of “playing God” were stoked after the creation of a fully synthetic cell by J. Craig Venter and the team behind the Genome Project. As with Moore’s other SyFy series, Battlestar Galactica, Helix is not perfect, and will need time and patience (from both the network and viewing audience) to strike the right chemistry and develop evenness in its storytelling. The dialogue feels forced at times, particularly among the lead characters and with rapid fire high-level scientific jargon, of which there is a surprising amount. Certain scenes involving the gruesomeness of the viruses feel too long and repetitive in the first episodes, but this will quickly dissipate as the plot develops. But for all of its minor blemishes, Helix is one of the smartest scientific premises to hit television in recent times, and looks to deftly explore familiar sci-fi themes of bioengineering ethics and the risks of ‘playing God’ just because we have the technology to do so. We’ve become accustomed to sci-fi terrifying us visually, such as the ‘walker’ zombies of The Walking Dead or even psychologically, as in the recent hit movie Gravity. But Helix’s terror is drawn from the utter plausibility of the scenario it presents. Helix will air on Friday nights at 10:00 PM ET/PT on SyFy channel. ScriptPhD.com covers science and technology in entertainment, media and advertising. Hire us for creative content development.